I've said it before & I'll say it again: find your people. The ones who lift you up & get your work. They're worth their weight in gold. The thing is, if I had read that tweet a year and a half ago, my reaction would have been "that's great, but how do I find them?" So, I'm going to tell you how I found mine because I'm not exaggerating when I say I had ZERO writing friends for years. Absolutely none. And I have NO IDEA how I made it through those years without them. Last year, in January of 2016, one of my resolutions for the year was to put myself out there so I could meet other writers. I was tired of being lonely in my writing life, and I desperately craved a community with other writers. I remembered two writers I'd met online during a Spring writing bootcamp years earlier, so I reached out to them and we started chatting. One of them introduced me to Rachel Solomon, another redheaded Seattle-area YA writer, and Rachel became my first writer friend who I talked to regularly and met up with in person. Rachel is also the person who told me about Pitch Wars, and I still get stressed out when I think about how close I was to never learning about that contest. Rach and I became fast friends, and so many wonderful things have come from this friendship. And all because I had a friend who knew Rachel on Twitter. The next big thing I did was sign up for Camp NaNoWriMo in April. I'd never done it before, but I saw people chatting about it on Twitter (see, it all comes back to Twitter) and decided to sign up. 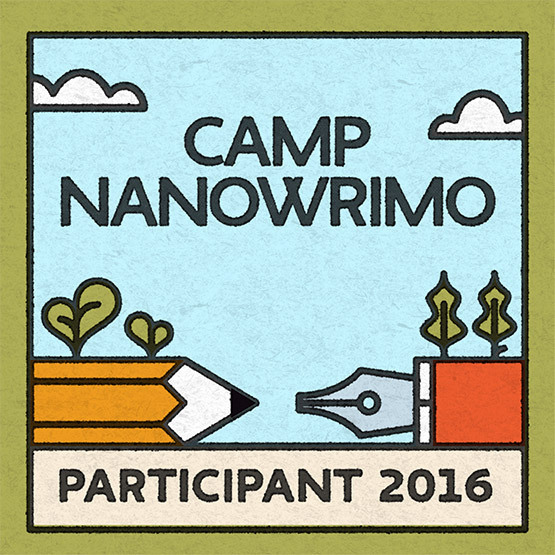 Camp NaNoWriMo has an option to join a cabin, which I HIGHLY recommend doing. Someone in my Twitter feed said they'd started a YA cabin, I asked to join, and just like that I met 12 new YA writers, several of whom became friends of mine. Okay, enough gushing about Pitch Wars. I realize that everything I've mentioned so far has been online, because that's where I had the most luck. My people, the writers who lift me up and get my work and support me... I met them online first. But I did try some in person things with varying successes. First, I learned about a Barnes and Noble Teen Buzz event on Twitter (HAHAHAHAHA), and one was happening at my local store, so I decided to go. 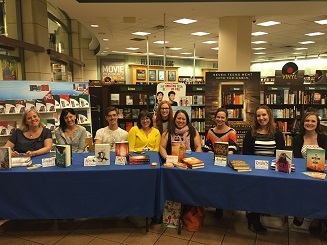 I met eight local YA authors, all of who were wonderfully kind and encouraging. I stayed in touch with several of the authors I met there (through Twitter, obviously) and started having coffee dates with some and even went on to become agent sisters with another. I had mixed luck with other things. I took a writing class, but it ended up being made up of people who mostly hadn't started writing yet. I tried to find some beta readers and ended up giving my manuscript to a few people who missed the "constructive" part of constructive criticism, and in turn, ended up ripping my writing apart (lesson learned: if you think you might be a good CP or beta match with someone, swap a query or first chapter to begin with, just to make sure you ARE a good fit). I looked for local writing groups on meetup.com, but that never yielded anything. The important thing, though, is that I kept at it. I kept putting myself out there, even after failed attempts and harsh feedback and tons of insecurity. And I'm so glad I did, because I've met some of the most incredible, supportive people I could have ever hoped for. The last point I want to make is something that's really important, and I didn't realize how important it was until a writer friend (hi Nova!) said this to me directly. But guys, it's really important to find and spend time with writers who take it as seriously as you do. That's not to say it isn't lovely to spend time with writers who are just getting started or who just have ideas at this point, because that can be fulfilling in a different way. But you need people who GET IT. You need other writers who view it the same as you do, so if your dream is to be published and you're sacrificing things to make that happen, spend time with other writers who are doing that. If you're querying, my goodness you NEED other writers who are querying too or who've been there before. And if you're still unsure about the whole Twitter thing, you can come say hi to me @TimesNewRachel – I promise I'll be super nice. Writer friends, how did you find your people?